red peppers | What's Cooking at the Genua's? This is a dish that I actually don’t really eat. I love the sausage part but if you remember I don’t like peppers. I know, what kind of Italian am I if I don’t like peppers. I’m trying to like them but it’s not working. Anyway, this is a very popular dish at our family gatherings. My brother-in-law Carl makes an incredible version of this. Nice and spicy, just how my Dad likes as well as my husband. Carl and my husband say it can never be too hot! They both have asbestos mouths so we can’t let them judge how hot things are! The hotness in this recipe will be decided on the type of sausage used. Hot sausage or sweet sausage, that is the question. I prefer sweet but those of you who love to sweat when you eat go for the hot! 1. Pierce each sausage in several places with a fork and place in a heavy frying pan with 1 tablespoon olive oil, over medium-low heat. Turn sausage occasionally and cook until well browned on all sides. 2. While the sausages are cooking, add 1 tablespoon olive oil and sauté the garlic and onion. Mix in the peppers and oregano. Don’t cover the pan or the peppers and onions will get steamed. 3. Cook until the onions are lightly brown and the peppers are tender. 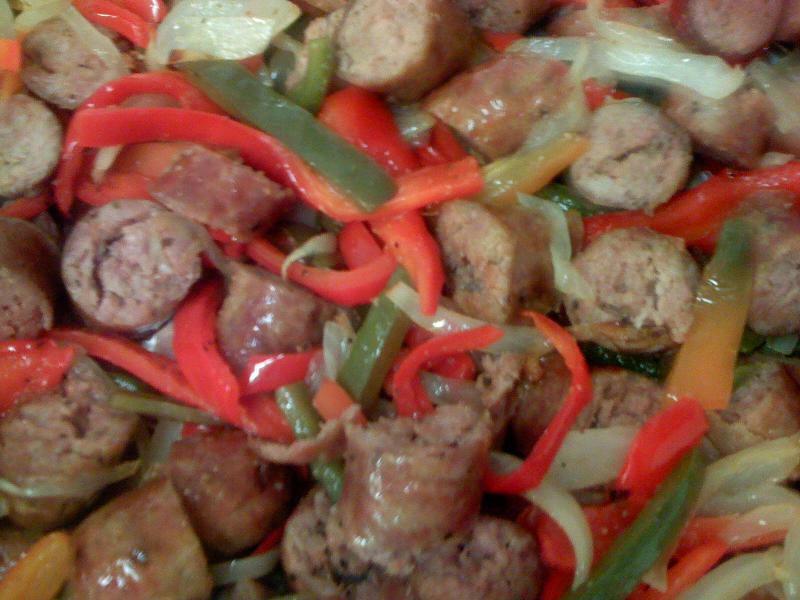 Cut the cooked sausage into bite size pieces and add to the onion and pepper mixture. Mix well. Place on a warm platter to serve. This dish is great with a nice loaf of crusty Italian bread and a glass of Chianti!